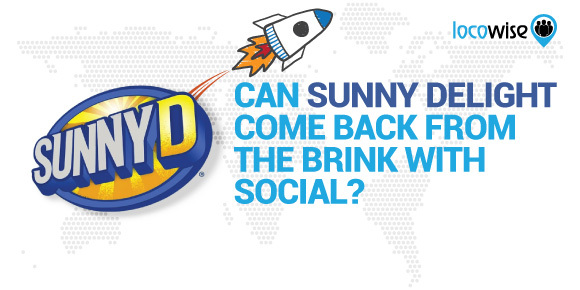 Can Sunny Delight Come Back From The Brink With Social? Sunny Delight has recently come back with a brand new focus and a brand new campaign on social media. The brand has had some major problems in the past, and if anything this new campaign shows how a troubled name can quite easily be resurrected. Whether or not their efforts will do enough to turn the drinks company around, the work here is fantastic. And it looks like the brand has decided to focus on what could well be it’s most lucrative demographic. This time it is focusing on teenagers. Going back a while now, at one point Sunny Delight was one of the biggest drinks available in the world. It had an incredibly powerful brand image, and actually managed to give Coca-Cola a run for its money. The drink was created and marketed by Procter and Gamble, and in 2004 it managed to bring in over 450 million dollars in revenue. It’s an orange juice drink, but it never actually pretended to be anything but a drink that contained some juice, but not a lot. The focus was wholly on the taste at first. Then it became the ‘healthy’ benefits of the drink. This is where the problems began. The amount of real juice in sunny Delight was always in question, and at the point where the drink was at its most popular, people began to scrutinise the content of the drink more carefully. To give you an idea of just how popular Sunny Delight was in the 90s, it was only introduced in the United Kingdom in 1998. A year later it was the third most popular drink in the country. The two drinks ahead of it were Coca Cola and Pepsi Cola. Back in 1998, the drink had a £10 million marketing campaign behind it. This marketing campaign leant heavily on the fact that it was a healthy alternative to fizzy drinks. It obviously resonated well with parents and authority bodies with an interest in looking after the health of young people. However, this popularity soon became a disappearing element, when people began to realise that Sunny Delight only contained 5% orange juice. In 1999, there was a famous television advert that Sunny Delight made, which contained images of a snowman drinking the drink. After the Snowman drank Sunny Delight, he turned orange. This was unfortunate, because a young girl, at around the time that the advertisement was airing on television, drank some Sunny Delight, too much in fact, and found that her skin was actually turning orange. The girl drank 1.5 litres of it per day. This is perhaps why her skin turned orange, but it couldn’t take away from the fact that the drink contained an artificial sweetener, which was directly blamed for the girl’s difficulty. Sunny Delight really began to be famous when it was made in and released in America. The brand’s fans over in America loved the drink, and were responsible for massive profits. One other crucial aspect of Sunny Delight’s rise to fame in the 1990s was it’s pioneering work on the internet. Before social media was even a thing, Sunny Delight ran a competition online that was a precursor to the modern social media competitions that influencers and brands regularly promote. It’s hard to communicate just how innovative this campaign was. The company placed Sunny Delight graphics, in the form of Sunny Delight bottles, on various websites in the US. Customers were given riddles on the Sunny Delight website, and then used the answers to those riddles to find the bottles. The bottles were displayed on various prominent websites and some personal websites. As part of the campaign, customers were advised to use search engines to find the bottles. Prices ranged from t-shirts all the way up to college scholarships. It was an incredibly creative and bold direction for a company to take in the mid 1990s. It definitely paved the way for the modern internet contest promotion. Sunny Delight is now back. It’s hitting the teenage demographic, and hard, with a delightfully intense and frenetic video commercial that shows young people enjoying the drink and being themselves. This is a direct attempt to both target young people and also understand them better. The modern teenager has 24-hour access to online content, and for that reason the modern teenager is more discerning than the teenager of the 1990s. They are much more individual and are used to expressing themselves online and off. The campaign for the hearts of teenagers is now a common theme in all it’s marketing, with one example being a recent Facebook post that addresses the new market explicitly. Can Sunny Delight gain ground once more? It all depends if a reputation disaster from the 1990s is powerful enough to make a new generation wary of it. So far, the work going forward is video-based, along with some images that refer parents to the process of buying Sunny D for their thirsty kids. Our own data on the Locowise platform shows that Sunny Delight currently has a neutral sentiment rating. It also has fewer than 30,000 followers on Facebook. This is a crucial point for the brand, and it’s hoped that targeting the teen demographic is the best way forward. We would say that they may need more than just video, and a more aggressive focus on the social media that matters to young people. We don’t think they have that just yet. Their Instagram has less than 5,000 followers. Surely that’s a good place to start with such a vibrant brand? If you’d like the kind of data that shows you, in an instant, what your audience thinks of your latest campaign, take out a Locowise subscription. We will even give you a week for free.